I just read a sad article about sudden oak death (SOD), a disease that is killing coast live oaks and other black oak species in forests along the California coast. In the article, experts basically concede there is nothing they can do to prevent its spread. What I find sad about this is that I don't think land managers have ever really made a serious effort (one expert on the disease who I once discussed this with said the politics were too difficult). While biologists studying the disease will bag and spray their shoes after working in SOD-infested habitat, there have been not been nearly enough substantial efforts to control it or, especially, to educate the public about how they can avoid spreading the disease. In Muir Woods National Monument just north of San Francisco, for example, which is highly infested with SOD, they have maybe a few small signs about the disease that few people ever see. In fact, when hiking in the area, I sometimes conduct informal surveys of other hikers and have found maybe 1 in 100 people to know about SOD and to have seen the signs. Pretty much every time I ask, "do you know about Sudden Oak Death", the hikers say "no". But they are always glad to learn about the disease and what they can do to avoid spreading it to their neighborhoods. The problem with this lack of education and control in a place like Muir Woods, which is highly and internationally visited, is that the neighborhoods that hikers might spread the disease to include forests all over the U.S. and world. I find the lack of effort (surely land managers can do better than a few small signs!) to reflect a frustrating level of inaction in fighting the spread of the disease. What might the consequences be? Here in the western U.S., oaks aren't a major timber species of economic importance, though they are a very important wildlife species, providing food and shelter for animals and plants alike. Back east, however, vulnerable species such as northern red oak (Quercus rubra), and eastern black oak (Quercus velutina) are of substantial importance to the region's timber industry. The introduction of SOD would therefore have a much more significant economic impact that it has had out here in California. Unless more stringent control and education measures are taken immediately in highly infested areas of California, I predict it is just a matter of time before the disease turns up back east. And then people will REALLY wish they had done more early on to control the disease out here in California. I hope that I am wrong, but this is a huge example of where a lack of funds and time invested in preventing the spread of an invasive species like SOD early allows the problem to balloon into something out of control, both ecologically and economically. As they say, an ounce of prevention... We've got to get these things early. In SOD's case, we really need to step up public education and control efforts here in California now, before the disease is spread to the east coast--especially at highly visited sites that are also highly infested, such as Muir Woods and many other trails in northern California. I guess it had to be expected, but with momentum building behind Al Gore's new movie, An Inconvenient Truth, people who are against progress (are regressive) when it comes to curbing global warming are resorting to the old "its gonna destroy our economy" myth. 1. The joint statement of the National Academies of Sciences of 11 leading world nations about the importance of fighting climate change? Society really needs the major TV news networks, who hold so much power over the public discourse, to step up a whole lot more than they have to properly inform the (voting) public about the opportunities offered by and threats to be averted by reversing climate change. It's not just big publications like Vanity Fair, Wired and the New York Times that are propelling the importance of sustainability into the public consciousness. It's the ever-powerful and high profile music industry, with a long list of artists (e.g., Jack Johnson, Dave Matthews, Bob Weir, Bonnie Rait, The Everyone Orchestra, ALO), promoters (e.g., of the first ever Green Apple Music Festival) and publications (e.g., JamBase and Relix) contributing to the cause. Guster’s Adam Gardner and his wife, Lauren Sullivan have created the first annual “Campus Consciousness Tour,” a project of their environmental non-profit, Reverb. The Campus Consciousness Tour’s aim is to educate, inspire, and activate students, and above all leave a positive impact on each community and college/university that the tour reaches. • Thanks to our partner NativeEnergy, each concert will be offset by wind power, neutralizing carbon emissions. For info on how you can offset your own power use, go to www.NativeEnergy.com/guster. • CCT will be partnering with the National Biodiesel Board to fill the tour buses with biodiesel fuel. Our goal is to use 100% biodiesel for the tour. For more info about biodiesel, click here. From Vanity Fair to Wired, the emerging Sustainability Revolution has received a special issue of the The New York Times Business Section! Not the Science or Environment or Health Section--the BUSINESS Section! We have linked to most of these stories in today's "Top Stories", "Business" and other appropriate news sections over at the CV web site. This wasn't happening just a few years ago. It is truly amazing to watch sustainability grow and to be a part of this emerging revolution. Alaskans are experiencing earlier snow melt, hydrologic changes, changes in the migration of sea mammals and caribou, and changes in plant distributions. The Inupiat are being heavily impacted by changes in their hunting practices due to thinning sea ice. In Mongolia's Altai-Sayan region, herders are observing more dust storms, drought, reduced plant height (biomass has declined 20-30% in the past 40 years), changes in plant species composition, livestock and game animals are not gaining enough weight and fat and their body size is decreasing, glaciers are disappearing, and permafrost is melting. The loss of glaciers and permafrost is bringing massive hydrologic changes. In Mongolia, 683 rivers and streams, 1,484 springs and 760 lakes and ponds have dried out. These changes are having devastating impacts on humans. Since 1999, over 12,000 households have lost more than 4 million head of livestock--a dramatic decline. In the Northern Andes, glaciers are rapidly disappearing, farming of potatoes has risen 300 meters (about 1,000 feet!) in elevation in the last 50 years (also due to socioeconomic forces - poorer people being moved out of more fertile valleys), people are grazing animals higher as snow levels rise (damaging soils and increasing erosion and water pollution at higher elevations), and amphibians are increasing in elevation, but decreasing in numbers. The list of ways that climate change is impacting both the environment and people's livelihoods and security now went on and on, from arctic to tropics, mountains to oceans, forests to grasslands. For people on the land--from nature reserve managers, to ranchers and herders, to farmers--climate change poses huge challenges. Are there ways to adjust their management practices that will enable them minimize the impacts of climate change on both their surroundings and their livelihoods? If they learn how their climate is predicted to change (e.g., that it is predicted to become hotter and drier, or perhaps wetter), are there ways that they can adjust their land management practices to minimize the impacts of these changes on both the environment and their livelihoods? Fortunately, the answer is "yes!" Still better, the associated management changes recommended by experts to promote resilience to climate change promise to benefit not just the health of the environment, but also people's livelihoods, health, safety and quality of life. 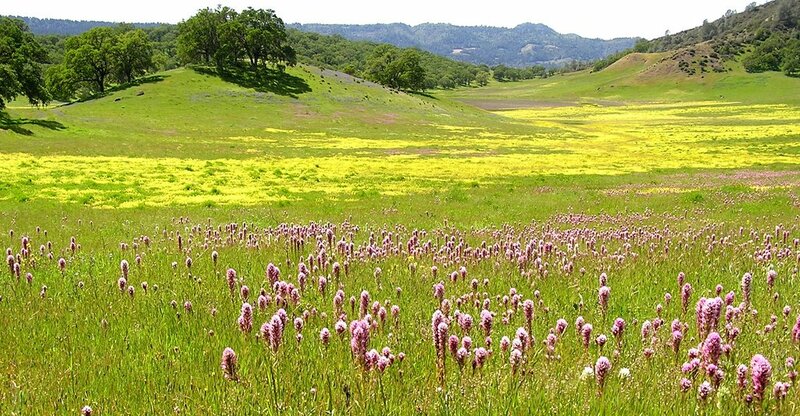 Let's take the example of grasslands and ranching in California, U.S.A. (pictured below), where climate change is predicted to bring more rainfall, though also more frequent and intense droughts. An increase in rainfall is likely to worsen an important non-climate-related (but still largely human-caused) problem these grasslands are already suffering from: the rapid invasion and spread of non-native weeds. These weeds not only harm California's grasslands by pushing out native plants and animals, but they also reduce ranchers' profits. For example, they are estimated to cost even the sparsely-populated state of Montana, U.S.A. over $100 million per year in control costs, lost productivity, reduced ranch real estate value, and other damages! When drought and destructive land management combine to reduce the abundance of native species, the result is often to open the door to replacement of the native species by weedy invaders. If the native species are sufficiently decimated, it is the weeds that are left to flourish when years of high precipitation follow drought. 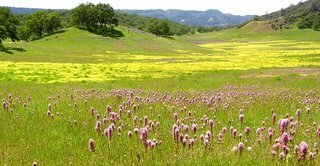 What can grassland managers do to prevent climate change from worsening weed invasions that harm California's native plants, animals and ranchers alike? Weeds are not only favored by climate change, but also by things like overgrazing and the presence of roads and off-road vehicles (ORVs). Vehicles spread weed seeds along roads, and livestock and ORVs both spread weed seeds and create the types of disturbances that allow weeds to push out native species. By preventing and minimizing these non-climate-related causes of weed invasions, managers can also help protect against climate change's potential impacts. Even better, since weed invasions cause extensive economic harm, the management strategies that minimize impacts of climate change on invasions will also save grassland managers money. In the Paramos grasslands of the northern Andes Mountains of South America, local people face a different suite of threats and solutions. Here millions of people get their drinking and agricultural water from glaciers that are predicted to disappear within the next several decades due to global warming. Water flows from the glaciers into the Paramos, alpine grasslands that lie between the glaciers and the human communities below. With rich, sponge-like soils and vegetation, the Paramos provide the environmental service of acting like a massive water factory, capturing and retaining water and then releasing it slowly to the lowlands below. Any changes in land management, such as new infrastructure development (e.g., building of extensive road networks) or heavy livestock grazing, that compact the soils and shrink the ability of the system to capture and hold water, will (1) reduce the Paramos' environmental service of providing a buffer against floods (by reducing absorption of water during extreme wet weather events) and (2) reduce its ability to provide a buffer against drought, since like a damaged sponge, the soils will have lost some of their capacity to store water. Management practices that maintain the health of the region's plants and soils will therefore provide valuable benefits to the communities below, protecting them against both the threat of torrential floods, and the threat of increased drought (and its impacts to their supply of drinking and agricultural water), posed by climate change. Currently, few people on the land, even among educated management experts with university degrees, are aware of this new need to factor climate change into their stewardship practices. Fortunately, lead by some heroic conservation and management experts at the World Wildlife Fund, Conservation International and The Nature Conservancy, strategies for managing natural systems to maximize their resilience to climate change are beginning to emerge. Let's hope that with effective communication and education campaigns, these strategies permeate the cultures of natural resource managers in time to build the resilience of natural systems to climate change. I spent last week in Washington D.C. as an instructor and facilitator for the World Wildlife Fund's Climate Camp, co-sponsored by the esteemed organizations, Conservation International and The Nature Conservancy. The week showcased the knowledge and ideas of a truly unbelievable group of conservation officers from around the world. We were coming together to share ideas and devise strategies for managing natural ecosystems and human communities in such a way as to maintain their resilience to climate change--their ability to bounce back and recover if we are able to somehow enact the solutions needed to cap warming to 2 degrees compared to before the fossil fuel era (that is another 1.3 degrees warmer than now--we have already warmed 0.7 degrees). More than 2 degrees of warming and we are in deeper trouble (in terms of avoiding dramatic changes to both human and natural communities). More than 4 degrees, most scientists believe, and our lives will get really bad. What I heard in presentations and saw in photo slides literally took my breath away. Around the world, from the Mongolian Steppe to the Andes, from the rainforests and savannahs of Africa to the Pacific Islands, from northern Alaska to Australia, local peoples are noticing frightening changes in their weather, plant growth, fish and wildlife migrations, livestock weight and fat content, and speed with which glaciers are receeding. Even in the taste of their drinking water and milk as accelereating glacial melt changes the water chemistry of streams and lakes. Most of these people have little if any knowledge of global climate change--that it is being caused in large part by the pollution of the rich nations of the world (the U.S., for example, contributes about 25% of the world's greenhouse gas emissions). They are thus left with the frightening mystery of "what in the world is going on with the weather?" Some simply have come to the conclusion that the Gods must be angry with them. Perhaps most alarming is the fact that 40% of the world's population gets its water for drinking and agriculture from glaciers that are retreating rapidly and are predicted to disappear within the coming 20-50 years. Where will these billions of people get the reliable flow of drinking and agricultural water they need once the glaciers disappear? This has the makings of a humanitarian crisis the likes of which the modern world has never seen. Fortunately, being able to see this now means that we should be able to act now. And fortunately increasing numbers of people, businesses and governments are. What they are finding is inspiring: the solutions needed to address these problems benefit people and planet alike. Of course first and foremost, we need to reduce our greenhouse gas emissions. It has simply not been a smart thing, from the standpoint of climate, to take hundreds of millions of years of buried carbon and combust it into the earth's atmosphere in just 100 years (if the earth were an apple, the atmosphere would be only as thick as its skin, so it is easy to see how putting humongous amounts of a heat-trapping gas like carbon dioxide into the atmosphere is going to change the climate). Clearly, we need much cleaner fuels and more efficient transportation, buildings, and living and business practices to dramatically reduce carbon emissions. Since efficiency means "using less to accomplish more", and using less both costs less and pollutes less, this provides us with tremendous opportunities to improve our lives and businesses, finances and profits, health and our quality of life (as we demonstrate over at the CVI web site). But what of maintaining the resilience of natural and human-altered (e.g. agricultural) ecosystems to the changes in temperature and precipitation that are accompanying climate change? Can more sustainable forestry, agricultural, livestock grazing, and other practices help provide a buffer to climate change's impacts? I'll get to that in Part II.